Illustrates how to use timelines to create an animated progress bar. Progress Bar animates rectangles and numbers using timelines. First, we create an empty Qt Quick project, as described in Creating Projects. For the purposes of this example, we call the project progressbar. In this example, we use two overlapping rectangles and a text label to create the progress bar. 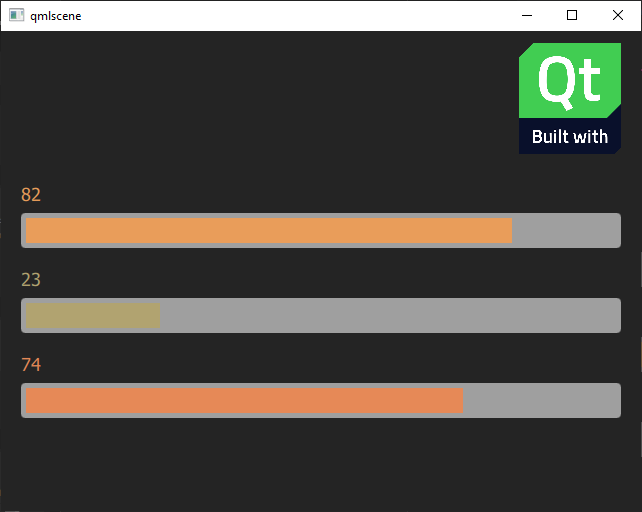 For another example of a progress bar, see the ProgressBar in Qt Quick Controls. In the Design mode, we drag and drop a Rectangle from the Library to the stage and modify its size to create the background for the progress bar. We change its id to background in the Properties view. We want to be able to control the background rectangle and the text label that was added by the project wizard, so we will use an Item for that. We drag and drop the item from the library to the stage and change its id to root. To make the background and text children of the item, we drag and drop them to the item in the Navigator. This enables us to use the anchor buttons in Properties > Layout to anchor them to their parent. We anchor the background to its parent on all edges, with a 30-pixel margin at the top to leave space for the text. We now drag and drop another rectangle on top of the background rectangle in the navigator and change its id to indicator in the properties. We then anchor the left, top, and bottom of the indicator to its parent with 5-pixel margins. We leave the right side free, because its value needs to change for the animation. For more information about creating components, see Creating Components. The text label will indicate the progress in numbers and changing color, while the indicator rectangle will indicate it by getting wider and changing color. To animate the label and indicator, we'll add timelines in the Timeline view. First, we add a color animation to the root item. We select the button to add a 100-frame timeline to root. You can use the default values for all other fields. To start recording a color animation on the timeline, we check that the playhead is at frame 0 and then select the (Auto Key (K)) button (or press k). We then set the color at frame 0 to green (#8de98d) in Properties > Text > Text Color. We can either pick a color from the color selector or use the Set Binding command in the (Nut) menu to open the Binding Editor. We then move the playhead to frame 50 and set the text color to red (#de4f4f). Finally, we move the playhead to frame 100 and set the color to yellow (#f0c861). We can drag the playhead along the timeline to see the color animation. We select indicator in Navigator and then select the record button again to animate the width of the indicator. At frame 0, we set the width to 0 in Properties > Geometry > Size. We then move the playhead to 100 frames and set the width to 590. We will now copy the color animation from the text label to the indicator. First, we right-click the text item in the Timeline view to open a context menu and select Copy All Keyframes from Item to copy the keyframe values we specified for the text label. Next, we select the indicator in the navigator, and then select Insert Keyframes for Item to paste the keyframe values to the indicator. When we move the playhead, we can see that the color animation is also applied to the indicator. We want the progress bar to be reusable, so we'll move it to a separate QML file. To make sure that the component will contain the timeline, we select Filter Tree > Show Only Visible Items in the sidebar menu. We then move the timeline to root in Navigator. 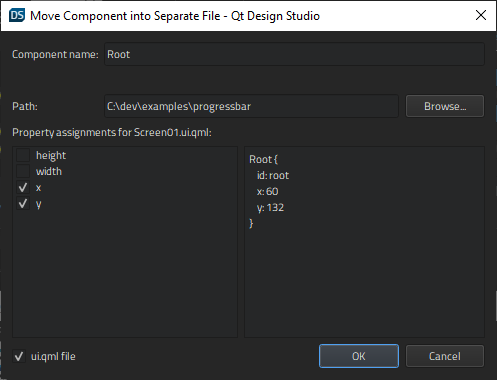 Now we can right-click root to open a context menu and select Move Component into Separate File. We can see the properties that will be available from outside of the component. We now select the root component in the navigator, and then select Go into Component in the context menu to move into the component. 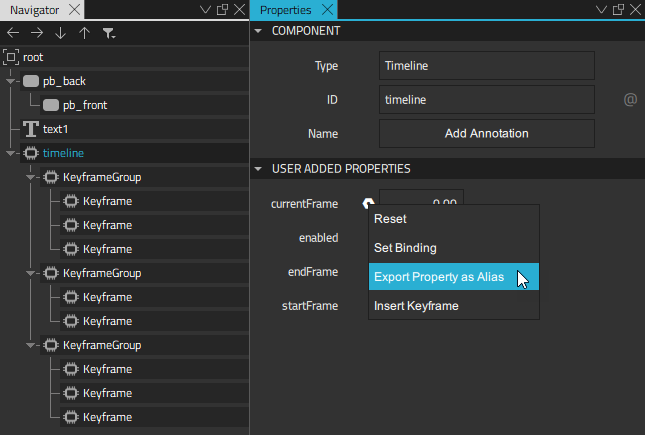 We want to be able to use the keyframe value as the value of the text label, so we will export it as a property alias. We select timeline in the navigator and then Properties > Timeline > Current frame > Nut > Export Property as Alias. When we select root in the navigator, we can see the timelineCurrentFrame property in Connections > Bindings. We double-click it to change its name to progress. When we move back to the top-level file, we can see that the number of the current keyframe (0) is displayed as the value of the text label. We want to experiment with different start and end values and easing curves, so we copy-paste the progress bar instance twice in the top-level file. We use a column layout to lay out the progress bar instances. We can now add timelines for each progress bar instance, with different settings. We select the button to add a 4000-frame timeline to the first progress bar instance (root). We select the Continuous check box, so that the animation will loop. In Properties > Root, we can see the progress property that we can animate. If we had called the component and property something else, we would see the names we gave them here. With the playhead in the first frame, we select the record button and give the progress property the initial value of 5. We then move the playhead to frame 2000 and give it the value of 95. We continue to the last frame and set the value back to 5 to have a smooth looping animation. When we select the Show Live Preview button on the canvas toolbar, we see a running number and moving progress indicator of the animated progress bar instance. We now change the settings of the other two progress bar instances. We make one of the indicators move from right to left by starting from frame 100. When all our progress bar instances have been animated, we'll continue by specifying easing curves for them. For more information about previewing UIs, see Previewing. We can add custom easing curves to every keyframe in the animations. 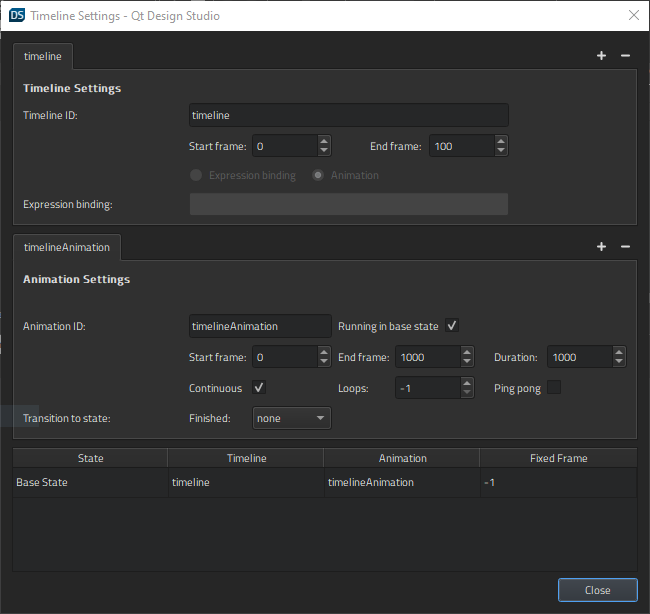 First, we select the keyframe to add the easing curve to, and then select Edit Easing Curve in the context menu. We can select several keyframes simultaneously if we want to use the same easing curve for them. We select the easing curve in the Easing Curve Editor. When we apply easing curves to animations, the shape of the keyframe marker changes from to . For more information, see Editing Easing Curves.